Concentrated with Chlorine-Free Bleach: Our All Temperature Laundry Powder with Oxygen Bleach and Orange Peel Extracts, cleans, brightens whites and colors, and deodorizes. Gentle and safe enough for your most delicate washables, leaves no irritating residues or harsh fumes. 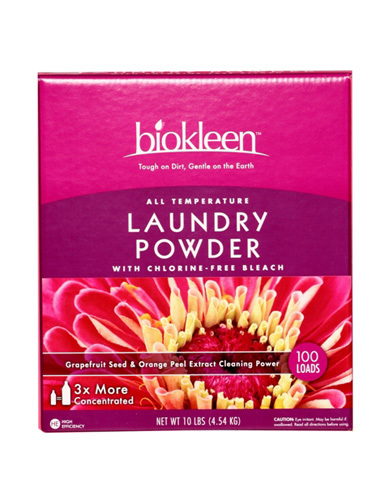 Our customers, including commercial laundries and diaper services, agree that BioKleen all natural laundry powder, with color safe oxygen bleach, gets all your laundry, from washable cottons to heavily soiled work clothes, cleaner, softer, brighter, and fresher than you have ever imagined. Even in cold or hard water. INGREDIENTS: Soda Ash, Zeolites, Sodium Citrate, Vegetable FIber Chelators, Sodium Percarbonate, Grapefruit Seed and Pulp Extracts, Orange Peel Extracts, Natural Corrosion Inhibitors, Surfactants-degreases and Conditioners form COconut and/or Corn, Low pH Silicates, Sodium Sulfate.